Reading the first story of Heroes Reborn Collection One, I wondered if, contrary to my initial assumptions, the stories were all simply rehashes of different episodes. However, after that opening tale, the other two were, as expected, new material offering background on two of the characters from the reboot series. My favourite by far was A Matter of Trust. It was interesting to learn more about how Father Mauricio discovered his powers and ended up a priest helping other Evos escape the country. Overall, these were enjoyable and well-written pieces that will delight any Heroes fan. 3.5-4 stars. A nationwide tragedy took away Luke and Joanne Collins’ son, and now they roam the country in search of those they feel were responsible for his death. Their goal is simple: catch and kill. When she jumped off a Ferris wheel in Central Park and survived, Claire Bennet changed the world. Now “Evos” - Evolved Humans - are exposed. In this story we discover what happened to Claire after that fateful moment. 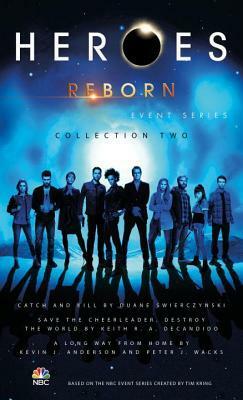 I enjoyed Heroes Reborn Collection Two more than Collection One. This time I found all three tales engaging; although, once more, my favourite was the second, because it was great to hear what was happening to some of my favourite characters from the original four seasons who didn't return for the reboot, especially a couple of short Sylar-moments. Once again, these were pleasing stories that will delight fans of the show. To me these three were better overall than the three in the first book, though, so this one is a solid 4-4.5 stars.